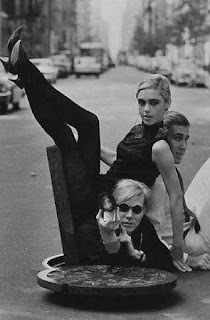 Edie Sedgwick did as much for black tights as Adam and Eve did for the apple. Sedgwick, an uptown girl with a Factory family, wore the tights with mules, and simple pullover shirts. In most instances, dresses were not required. You'd need gams for this look. It won't work for any old ham hock. Edie's look seems likely to have been at least partially inspired by Audrey Hepburn in Funny Face, which had been released eight years before this photograph was taken. As a downtown style icon, Edie knew no peer, concentrating her look on her eyes and h er earrings, with clothes as careless backdrop. So new and exciting was Edie's exotic, slightly messy silhouette that Diana Vreeland used her as a model in a 1965 Vogue spread that dubbed Edie a "youthquaker." The Adam + Eve dress (right) borrows the shape of a 1960s paper dress and something of Rudi Gernreich's futurism. Paired with the tights, as shown, the dress is a good facsimile of Edie's dressier moments, that is, when she covered her tail. Pair it with kitten heels and chandelier earrings and leave the drugs where they belong, downstairs at Max's.